Ilya Gringolts: Music is a language. Just speak the language. 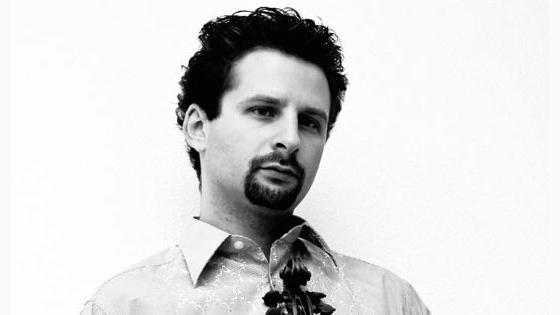 May 7, 2018, 1:35 PM · Baroque, contemporary, solo, chambers, orchestral works, the Russian violinist Ilya Gringolts plays it all. He tries to keep his options open and his repertoire as broad as possible. It goes from ancient music on old instruments to new music and commissions, and then, of course, string quartets, and everything that is left in between, which is a lot. "I think these days you can’t just play the main stream repertoire. I don’t think anyone can afford that anymore. I would find it boring to just play the same things over and over again, I would not know what to do with it, I want to keep learning." I always admired Gringolts' musical drives and overall enchanting crystal sound. Interviewing him was marvelously inspiring. He is an extremely alive and passionate musician. We discussed difficulties associated to music performance today and the different roles of the music teachers, students and performers. He also talked about the charms and beauties of Dutilleux’s Violin Concerto: L’Arbre des songes, which he was going to perform the next day in Taipei. Ilya Gringolts. Image courtesy of the artist. Gringolts strongly believes in performing new music. He is sorry to see that musicians and audience doesn’t always show much interest. "I may sound pedantic but I think our mission as performers is to have dialogues with living composers, first of all. That is how it was until very recently. Until the last 100 years, only new music was performed. Until Mendelssohn rediscovered Bach, people didn’t play music that was written in the past because they could not connect nor relate to it." "In a way, that could explain the problem we have now with the audience shrinking, it might have to do with that connection that we lost," he said. "People don’t have enough connections to the music written before them, but they also don’t have enough understanding of the music that is being written now because it is not played enough. Of course, if you don’t get enough of something, you don’t get use to it. Music is like anything else; it is not always love at first sight. You have to be exposed to it for a period of time before you start to like it and understanding how it works." "Several reasons explain why today’s musicians are not that enthusiastic about new music," he said. "First of all, there is much more repertoire now than ever before, much more ‘old music’ to be played. There is not enough time to play everything, so it is about prioritizing. Then, it is a question of complexity, too. Obviously, the level of performing has risen so much that composers can basically write anything on any level of difficulty; there will always be someone who will be good enough to play it. The story of Auer and the Tchaikovsky Concerto will never happen again." "The extreme complexity of some new music makes it difficult for the listeners to understand. It is like the chicken and the egg’s problem: you don’t listen enough of this music, you don’t get to like it. Performers should always make music understandable to themselves and to the listeners. It is not an easy thing – especially for violinists, because the instrument is so difficult that we often just occupy ourselves with petty technical problems and there is no time left for interpretation." Gringolts was about to play the infrequently heard Dutilleux Violin concerto in Taipei. I asked him his thoughts on the possible audience’s receptiveness of such a work. "Of course, I cannot speak for the audience in general because such a thing as ‘an audience in general’ doesn’t exist. An audience is always a composite of parts, of people who are in a hall. But Dutilleux is the kind of composer that exists in the context of European music, not necessarily just within the French music. There is everything there, there is Stravinsky and there is Bartok, there is Messiaen and, of course, Ravel. It is a kind of music that has its own language." "It is completely atonal but at the same time it is – to me – maybe one of the most accessible musical styles of the 20th century. It is certainly one of the most beautiful ways of writing for big orchestras that I know. With the sweeping strings and the percussion, the way the harmony is treated: these blocks of chords moving, it is almost Hollywood music. It is all very harmonious, very inviting, it is one of the most positive music somehow. It makes me think of French art in general, the colors, Gauguin, Renoir…"
Dutilleux himself said he wanted to write something very positive -- positive like a big tree, thus the name of the concerto, L’Arbre des songes or "The Tree of Dreams"). The work symbolizes the tree, the dream, the contemplation. "The tree, you can almost see it grow. You can see the branches coming out of it like in a fast-forward film of a growing tree. It all grows out of nothing, out of the single note that begins this concerto." "But, of course, we don’t need to know about the tree, we just need to enjoy the flow of the music. This is really one of the pieces with which I don’t worry about accessibility and how people are going to perceive it. There is a reason why Dutilleux’s music becomes so popular today: it is because of its flavor, its harmonic language that is just so wonderful, so appealing." As Dutilleux explained it, in his concerto "the solo instrument is closely dependent on the orchestral environment and vice versa, the same pulsation animating both." The effect is very refreshing. It opens the door to a fantastic world where the listener seems to navigate in three dimensions. "There are many moments in this concerto when the violin and the orchestra have a direct dialogue. They don’t really respond to each other but more like they are completing each other’s sentences. The instruments share the same motives. This gives the effect of many people in the room saying the same thing. You basically get this wonderful stereo effect of multiple voices saying the same thing. There are many dimensions to this music, all spreading out from very simple motives sometimes." For Gringolts, a teacher should, first of all, motivate his students to find and set goals of expression and then use technique to achieve them. "As a teacher I am noticing that a lot of students today just don’t have enough interest in music really. They should be more open to all sorts of music, to the expression also. A lot of it is brought down to technical problems, which, of course, is unavoidable but you have to handle the technical problems as a way to get you somewhere so that technic is a vehicle to achieve something. That is the progression that needs to be reached." "Music is a language. Just speak the language. To speak the language, you need to know the alphabet, you need to know how to pronounce words, you need to know how to form sentences, and how to conjugate verbs. The same rules apply if you are an actor. If you have the script in front of you, you have to know how to pronounce the text but also where to put emphasizes. It is all the same rhetorical things that we use, only it is not so obvious when we do something wrong. This is what we have to work on, first of all." "Then we need to put feelings and meanings and emotions into this language, because a language even if you say the words correctly and pronounce everything, even if the intonation is right, it will lack emotional content and won’t make an effect. Emotional content is what makes music. But again if you have the emotional content but the emphasizes in the wrong place you don’t go anywhere. And, of course, every musical style is different, you can’t play Ravel like you play Mozart, and you can’t play Beethoven like you play Brahms. Those are all different languages. Music and language are one and the same thing." "Before going to stage I try to achieve this special state of mind, slightly nervous, slightly elevated, excited I guess. I think the presence of people does it to you automatically. Some years ago I use to get very nervous, I think maybe because I wasn’t at home technically and musically. "I learned that the more you are convinced of what you do, the less nervous you get. There will always be surprises from concerts – good or bad. You have to be prepared that your muscles will do things you might have not expected. That is what adrenaline does. Remember that you can’t count on everything, you can’t plan everything, and that is maybe the beauty of it. It only exists in that time, on that moment." May 7, 2018 at 10:42 PM · Thank you Jacqueline Vanasse for this fascinating interview of Ilya Gringolts! As a devotee of early music yet also attending many "new music" concerts plus (lately) many "classic" operas being re-arranged for "immediate accessibility," --I appreciate what Mr. Gringolts has to say about the importance of dialogue with living composers and how music is not just form but also emotional meaning, all of which is the goal and technical challenges are only in service of that language and meaning. May 9, 2018 at 02:48 AM · The claim that before Mendelssohn, no one performed significantly earlier music is demonstrably false. Young Mozart gained notoriety and an audience with the Pope for jotting down the Allegri Miserere, written between 1623 and 1644. Mozart was born in 1756, and the transcription took place during an Easter visit to Rome when he was 14. May 10, 2018 at 12:44 AM · Bill Palmer, I did not read it as an absolute statement when Ilya Gringolts was quoted as saying "Until the last 100 years, only new music was performed. Until Mendelssohn rediscovered Bach, people didn’t play music that was written in the past because they could not connect nor relate to it." Think of the busy schedules of, for example, Bach, Handel or Haydn --always producing another new work for the upcoming concert (or church service). Of course there were libraries of published works and manuscripts from past masters, studied by composers and cantors, but is that what audiences were listening to in the palaces, opera houses, symphony halls or churches? I don't have a statistical answer, and surely it would vary in different venues and locales, but I had the same general understanding as expressed by Gringolts, that the repertoire most often performed before the 20th century was mostly "new"music. I imagine recordings have contributed to audience attachment to the "standard repertoire" that might seem a bit fossilized to some (though not to me, I love having many centuries of music on my menu! ).